Hard to believe that January, 2013 is in its last week already. The past three weeks here in the Yellowstone Basin and Jackson Hole have been cold. Some of the temperatures in the Moran Junction area were recorded as low as -38 degrees earlier this week. In Jackson the temperatures have been below zero almost every day. The high temps for the day if lucky have been just above zero. That seems to be changing now as the cold temps are moving to the east. I laugh at the news reports when they say the low is going to be in the low 20’s. The good thing about these cold days is that they are created by a high pressure area and the sky’s are generally clear and blue. I have been out almost every morning looking for something special to shoot with my camera and it has been slim pickins as they say. This morning I traveled north of town with Peyton after stopping for our morning cup of coffee and a blueberry scone. The sky was absolutely clear – devoid of morning haze and such. 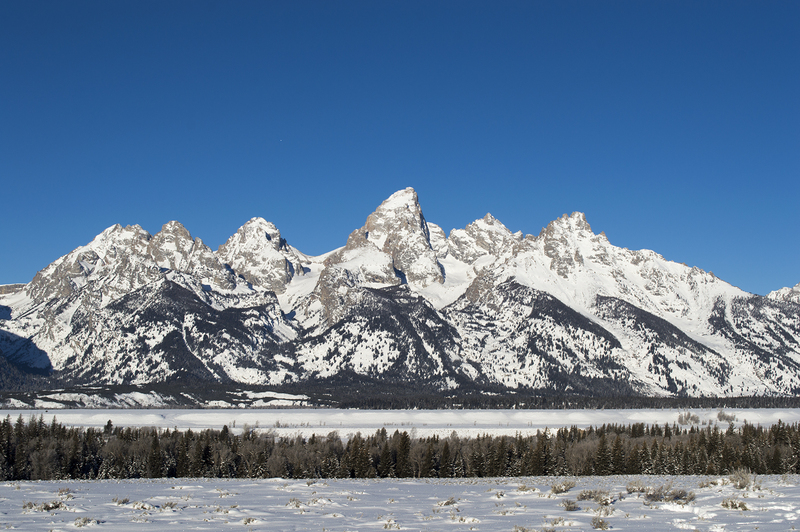 On mornings such as these the skyline that is behind the Teton Range to the west is usually a dark blue that helps perfectly highlight the shape of these magnificent peaks.